We use green cleaning supplies, green beauty products, compost, use cloth napkins and bags--I mean, we do not even have a garbage disposal. But as I sit in my home, I know there is so much more I could be doing. So obviously it can feel and be incredibly overwhelming to do everything all at once so I started with the master bedroom. This has been the one room that tends to get the least bit of attention because nobody really sees it except Lin and I. I have tried to make it feel like such a sanctuary but have come up short. I love the feeling of staying in a fabulous swanky hotel-when a room is so cozy you never want to leave it. (we actually have been on vacay and extended our trip to just relax in the room--true story) That's the feeling I want for our master suite. I mean there IS nothing better than sinking into a hotel bed after a day of exploring …aside from returning to your own bed at home after a long trip, I suppose. So what if you could combine the luxury of a hotel stay with the comfort of your own space--and keep things green???!! Well--you can and you should! We are already feeling better after just incorporating two things-bedding and home fragrance. A great mattress and high quality bedding are so important to create your cozy sanctuary and get that beauty sleep. Most fabulous hotels never skimp on bedding! Loving the graphite color too. It's such a nice contrast to the bright room. The other ingredients for the perfect hotel-style bed? A variety of pillows. Cariloha makes some great ones! They also have duvet covers, duvet comforters, and blankets. Check that out here. You just have to get into the store to feel these things!! Oh and try to make your bed every single morning! For me, it really just sets the tone of my day. And have you ever checked into a hotel with an unmade bed?? In honor of Earth Day today please enjoy 20% off your purchase at Cariloha Tulsa in Utica Square. They are having a great event on Earth Day this weekend so pop over and say hi to the amazing team. Tell them you are a Go French Yourself reader for your discount! And if you cannot make the event— don’t fret! From now until the end of June you can always get your 20% off with my discount code at the Tulsa location! Just tell them you are a Go French Yourself reader! Candles are scientifically proven to soothe us. The gentle, mesmerizing quality of their light makes them a perfect aid for any relaxation routine. They always transform my mood. Candles are scientifically proven to soothe us. And a scented candle offers additional benefits. We all have our trigger scents! 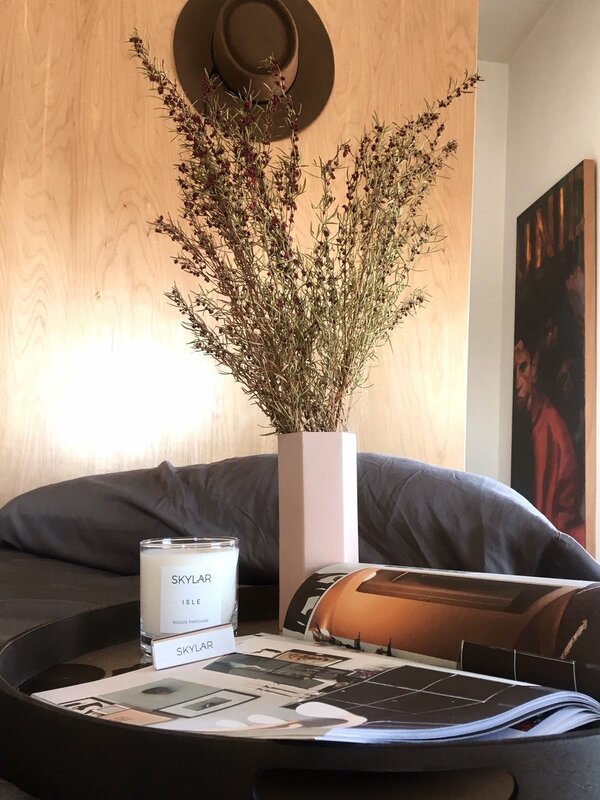 By choosing a scent we find relaxing, or a scent known for its calming properties, you can enhance your non toxic bedroom makeover experience. 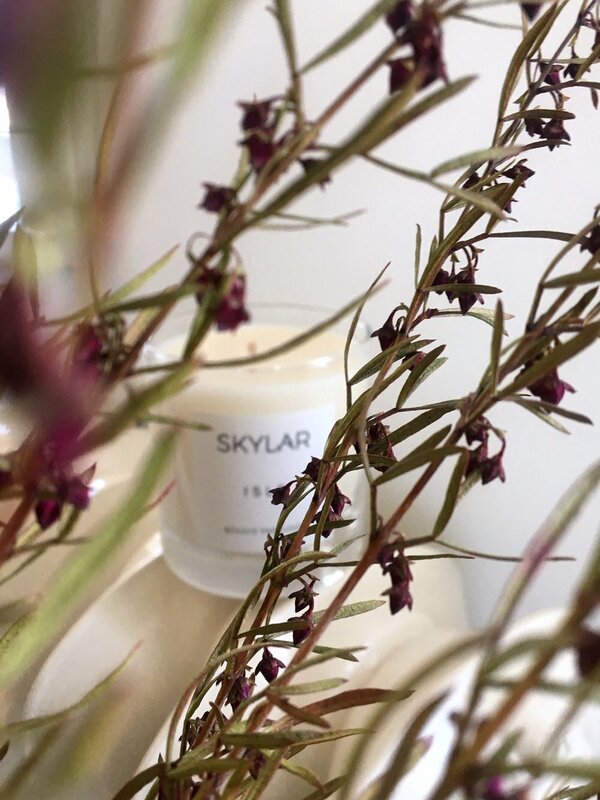 I am a big fan of Skylar Body and love their perfumes (even using them as room sprays) and have been dreaming of them launching a candle line. Happy birthday Skylar Body Home Fragrance! Why you will love these candles. My favorites are Isle and Meadow. Isle has such a fresh clean scent that instantly puts me in vacay mode. She was inspired by the purity of water and the ease of a day spent near the ocean so it makes sense. I just love the sandalwood in it! 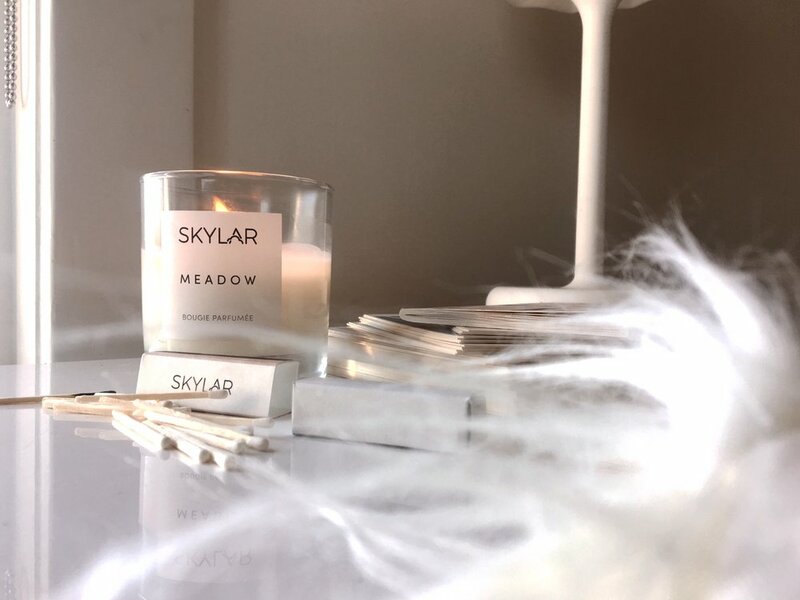 Meadow was inspired by enticing dreamers and doers and this scent has notes of tuberose, jasmine, and orange blossom that bring natural, flower- filled beauty into the home. The light and flirty scent embodies everything I adore about flowers without being overly fragrant. They will burn for 50 hours too! To celebrate their launch they are offering a free gold candle trimmer valued at $16 to everyone who purchases a candle today for their launch! Cheers to better sleep! And breathing easy, love! What are you doing to lessen your carbon footprint this month?! And every month moving forward?! Thank you for sponsoring this post Cariloha Tulsa and Skylar Body.